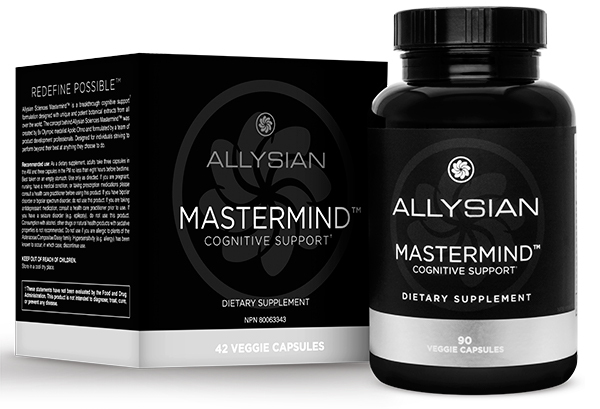 Allysian Sciences Mastermind™ is a breakthrough cognitive support† formulation made with unique, potent and proven herbal and botanical extracts from all around the world and designed to help you perform at your best. Allysian Mastermind™ was formulated by health and wellness professionals for elite performers and those striving to be the absolute best in any arena, at any stage of life. Allysian Mastermind™ is manufactured in state-of-the-art GMP certified Canadian facilities. The hand-selected ingredients are carefully sourced and each batch is chosen and tested for its potency, stability and efficacy. potency, stability and efficacy. Extensive literature reviews were conducted to support the ingredients chosen for Mastermind, with each ingredient contributing benefits supported by clinical trials, including Cereboost© American Ginseng. Cereboost® showed, in third party, double-blind, placebo controlled studies a 15.6% improvement of working memory capacity and 9.9% improvement of working memory reaction time. Helps to enhance cognitive function in adults. Helps to enhance memory in adults. 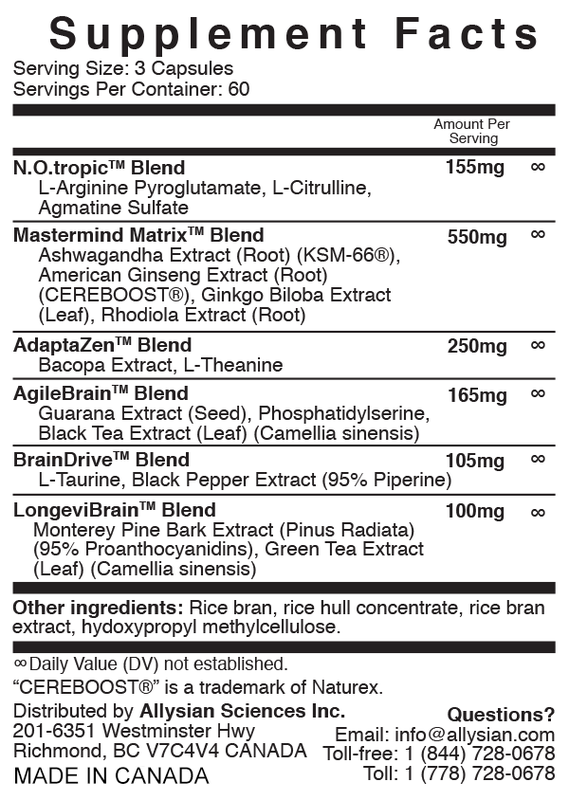 Helps to support cognitive health and/or brain function. Helps support mental focus and mental stamina. Relieve symptoms of stress (mental fatigue and sensation of weakness). Helps relieve nervous dyspepsia / to help digestion in cases of nervousness and/or stress. Helps increase resistance to stress/anxiety in individuals with a history of chronic stress, thereby improving their overall quality of life. Athletic support or workout/exercise supplement. Source of an amino acid involved in muscle protein synthesis. We knew about the health benefits of nitric oxide long before scientists were aware of its presence in the human body. Nitroglycerin, a drug that works on nitric oxide pathways, was adopted as a medical therapy for angina and high blood pressure in the 1880s, but another century passed before anyone had any idea of why it worked. The discovery of nitric oxide and its biological activities was so significant that the 1998 Nobel Prize was awarded to the three pharmacologists who identified and furthered our understanding of this incredibly important molecule affecting every area of our health. Let's take a look at the multiple roles and benefits of nitric oxide and how you can increase its production to improve numerous aspects of your health. In traditional Chinese Medicine it is known to reduce stress and enhance clarity. What is Cereboost™ American Ginseng? Cereboost™ is a patent pending extract made from American Ginseng (Panax quinquefolius L.), chosen for its specific levels of certain beneficial compounds and clinically proven activity on brain function, including working memory and alertness *43. Cereboost™ went through an extensive gold standard randomized, double-blind, placebo-controlled crossover study that demonstrated a significant positive impact on cognitive performance in healthy individuals. The study was validated by the COMPASS(Computerised Mental Performance Assessment System) battery test, conducted at the NICM Centre for the Study of Natural Medicines and Neurocognition, Brain Sciences Institute in Melbourne, Australia. The most important component of American Ginseng in Cereboost™ is the saponin fraction, commonly known as ginsenosides, due to its high bioactivity in the body. The total ginsenoside content in the Panax quinoquefolius root increases with age and location. The process of obtaining Cereboost™ has been meticulously studied and perfected to consistently guarantee the full integrity of the active ingredient, ginsenoside, extracted from the raw material. By increasing the accuracy during a choice reaction task, Cereboost™ enhances the ability to sustain focus over time. By speeding the reaction time, Cereboost™ reduces the time it takes to retrieve an item from working memory. By ameliorating the working memory capacity, Cereboost™ helps to extend the memory span. KSM-66® Ashwagandha is the highest potency ashwagandha root extract available on the market, that was created using a proprietary process that took 14 years of research and development to develop and refine *49. KSM-66® Ashwagandha is a clinically proven and award winning ingredient and known as the world's best ashwagandha having gone through 14 certifications. † *These statements have not been evaluated by the Food and Drug Administration. This product is not intended to diagnose, treat, cure or prevent any disease. Kumar S, Harris RJ, Seal CJ, Okello EJ. An aqueous extract of Withania somnifera root inhibits amyloid Î² fibril formation in vitro. Phytother Res. 2012;26(1):113-7.
æ©æ¬æé, éä¸­æºä¸é, & è¥¿å²¡äºå¤«. (1992). Tannins and Related Compounds. CXIV. 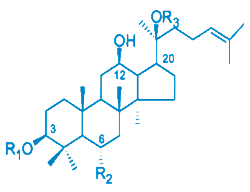 Structures of Novel Fermentation Products, Theogallinin, Theaflavonin and Desgalloyl Theaflavonin from Black Tea, and Changes of Tea Leaf Polyphenols during Fermentation. Chemical and pharmaceutical bulletin,40(6), 1383-1389. Åuczaj, W., & Skrzydlewska, E. (2005). Antioxidative properties of black tea.Preventive medicine, 40(6), 910-918. Included for its ability to increase nitric oxide production, increasing blood flow to improve cognitive function, attention, and mental performance over 8 weeks. *103-109 Proanthocyanidins act as a polyphenol, present in grape skins and red wine, that may have a role in prevention of cancer and cardiovascular diseases. Luzzi, R., Belcaro, G., Zulli, C., Cesarone, M. R., Cornelli, U., Dugall, M., ... & Feragalli, B. (2011). PycnogenolÂ® supplementation improves cognitive function, attention and mental performance in students. Panminerva medica,53(3 Suppl 1), 75-82. Nishioka, K., Hidaka, T., Nakamura, S., Umemura, T., Jitsuiki, D., Soga, J., ... & Higashi, Y. (2007). PycnogenolÂ®, French maritime pine bark extract, augments endothelium-dependent vasodilation in humans. Hypertension Research, 30(9), 775. Liu, X., Wei, J., Tan, F., Zhou, S., WÃ¼rthwein, G., & Rohdewald, P. (2004). Pycnogenol®, French maritime pine bark extract, improves endothelial function of hypertensive patients. Life sciences, 74(7), 855-862. SantosâBuelga, C., & Scalbert, A. (2000). Proanthocyanidins and tanninâlike compoundsânature, occurrence, dietary intake and effects on nutrition and health. Journal of the Science of Food and Agriculture, 80(7), 1094-1117. Ciesek, S., von Hahn, T., Colpitts, C. C., Schang, L. M., Friesland, M., Steinmann, J., ... & Pietschmann, T. (2011). The green tea polyphenol, epigallocatechinâ3âgallate, inhibits hepatitis C virus entry. Hepatology, 54(6), 1947-1955. As a dietary supplement, adults take three (3) capsules in the AM and three capsules in the PM no less than eight hours before bedtime. Best taken on an empty stomach at least 30 minutes before a meal. Use only as directed. "When you take Mastermind™, you are providing your body and brain the highest quality nutrients possible specifically designed to give you that edge and achieve peak performance.† "